"Meerschaum has been called Venus of the Sea, White Goddess, sepiolite, sea-foam or froth, the Aristocrat of smoking substances! It has been identified as hydrous magnesium silicate, an opaque white-gray or cream colored mineral of the soapstone family. It has been written as H4Mg;Si30 ,o, 3S .O^MgO^H^O, 2MgO, S,0;-14H20 and even Mg4(H;0)3(OH),SitO,5-3H;0! Whatever its composition, meerschaum is not the bone of the sepia or cuttle fish, the residue or fusion of decomposed sea shells, petrified sea foam or a clay composition. It is a mineral! Mined 30 to 450 feet below the surface of the earth, the magnesium content provides strength while the hydrogen and oxygen contribute to its porosity. It is, in the words of one, “. . . soft and light as a fleeting dream, creamy, delicate and sweet as the complexion of young maidenhood.” -Benjamin Rapaport, A Complete Guide to Collecting Antique Pipes. 1979. For hundreds of years, Meerschaum Pipes have been known as the ultimate pipe for enjoying the pleasures of pipe smoking. For over 30 years we have been importing Meerschaum pipes from Turkey, supplying you with the most prestigious, enjoyable, and beautiful pipes you will ever have the pleasure to own. In the past, Meerschaum products were only available in the highest quality pipe and tobacco shops. Today, we bring these high quality, individually hand-carved Meerschaum pipes, and other unique Meerschaum products and gift items to you through our web site. Each Meerschaum pipe is a hand-crafted work of art you will be proud to pass on from generation to generation. We have many pipe sizes and varieties to choose from and all pipes are hand carved from 100% solid block Meerschaum. Since every Meerschaum Pipe we sell is individually hand carved, the first step is for the craftsmen to select only the stones which he feels to be of the finest quality based upon size of the stone, density, color, and homogeneity. The carvers then transform this block of raw stone, using the same hand carving techniques which have been handed down from generation to generation, into various styles of pipes from the elegant smooth pipes, to intricately carved designs. This makes Meerschaum pipes one of the most prestigious, enjoyable, and beautiful pipes you can own. The final process in crafting a Meerschaum pipe is drying out excess moisture, fitting it with a custom stem, dipping it in a coating of special protective wax, and then polishing. As long as your hands are not excessively greasy or dirty, TOUCH YOUR PIPE, hold it proudly, it has been carved for you to enjoy its coolness of smoke and pride of ownership. Meerschaum : Literally translated from German means "seafoam." This name reflects its characteristics of lightness in weight and whiteness in color. It is one of the most porous substances found in nature, will not burn out, and is considered by pipe smokers as the perfect material for a cool, dry smoke. Unlike Briar Wood pipes, Meerschaum is a mineral. (Hydrous Magnesium Silicate). Today the highest quality Meerschaum deposits are not found near any body of water but, are found in only one area of the world, the open plains of central Turkey surrounding the small city of Eskisehir. Meerschaum is mined wet from depths of up to 500 feet and is bought by carvers in various size blocks or lumps called stones , then hand carved into what many consider one of the finest smoking pipes available. Pipe Making : Since every IK Meerschaum Pipe we sell is individually hand carved, the first step is for the craftsmen to select only the stones which he feels to be of the finest quality based upon size of the stone, density, color, and homogeneity. The carvers then transform this block of raw stone into carvable pieces and using the same hand carving techniques which have been handed down from generation to generation create various styles of pipes from the elegant smooth shapes, to intricately carved designs. This makes Meerschaum Pipes one of the most prestigious, enjoyable, and beautiful pipes you can own. The final process in crafting a Meerschaum pipe is drying out excess moisture, fitting it with a custom stem, dipping it in a coating of special protective wax unique to each carver, and then polishing. Some pipes have been coated in wax an extra 2 or 3 times before it's final polishing. Some carvers use only one coat, some use more. This is another feature that can even make the color of a new pipe unique. As long as your hands are not excessively greasy or dirty, TOUCH YOUR PIPE , hold it proudly, it has been carved for you to enjoy its coolness of smoke and pride of ownership. Coloring : Because of its natural porous nature, Solid Block Meerschaum's most fascinating characteristic is its process of gradually changing colors from white to a golden deep cherry red or brown. Since each stone is unique unto itself, each pipe will color at various speeds and shades, I have seen pipes color in 2 months and some color in 12 months. It is impossible to tell just how long it will take your pipe to color. Some factors affecting this colorization vary from your particular smoking habits, different types of tobacco, to the amount of time you smoke your pipe. NOTE : Solid Block Meerschaum will color more naturally . Myself and many other experts consider pressed, re-formed, or Meerschaum lined pipes to be of lesser quality and should not be expected to have the same characteristics as Solid Block Meerschaum . Re-formulated about 8 years ago, now pressed can actually be lighter then solid block. It is the reputation and guarantee received from the dealer or seller you buy from that is your guarantee of the highest quality Solid Block Meerschaum Pipe. 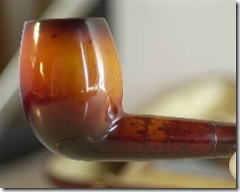 You can find a FANTASTIC example of a colored meerschaum pipe in this posting on the Tobacco Barn blog on PipeTrader.com. Breaking In : No need to break in your new pipe. Unlike Briar, the natural mineral quality of Meerschaum needs no caking to enjoy the true, pure taste of your favorite blend. Fill it gradually, remember it only needs to be filled half way. Now your ready to light it so strike a match or flick a lighter and apply the flame. As the heat from the flame comes in contact with the tobacco the tobacco will expand up towards the top of the bowl so grab your tamper and apply pressure to the smoldering tobacco, but don't stop puffing. CAUTION: Although the newer Jet Flame Lighters may be great for Cigars, DO NOT use these type of High Heat lighters with a pipe, they can overheat the bowl and ruin a pipe. Care : There are many misconceptions surrounding Meerschaum pipes. Remember, just as no two pipes are exactly the same, no two pipe smokers are exactly the same. Don't be afraid to hold and handle your Meerschaum pipe. Smoking your pipe is a traditional pleasure and watching it color adds to your enjoyment. Also, unlike Briar which must be dried after each smoke, Meerschaum can be smoked many times a day because of its absorbing qualities. If your pipe becomes soiled or dirty, use cotton or a soft cloth with just a drop of after shave lotion or similar product containing a slight trace of clear alcohol and gently wipe it clean when the pipe is cool. Never boil or scrape your pipe. If a cake starts forming in your pipe, which is not unusual, lightly ream it out being careful not to scrape or dig into the pipe itself. Be gentle and use a pipe cleaner when cleaning inside the stem and shank. Most Meerschaum Pipes now use a push-pull type tenon to connect the stem to the shank, remember to hold the shank and ALWAYS turn the stem CLOCKWISE while pulling out or pushing the stem back in. Lastly, if your pipe has a custom fitted case, it is wise to wait until after the pipe has cooled before placing pipe back in the case. For hundreds of years, Meerschaum Pipes have been known as the ultimate pipe for enjoying the pleasures of smoking. Because each Meerschaum Pipe is a hand-crafted work of art, it is passed on from generation to generation giving each a special pride of ownership. We have been involved in the Meerschaum Pipe business for approximately 25 years and have been to Turkey many, many times for both business and pleasure and am very pleased to say that all my experiences have not only been both informative and interesting but, also warm and friendly. From the deep Meerschaum mines in central Turkey , to the friendly small workshops of ohhh so many carvers, if you have any questions or if we can help you in any way, please feel free to contact us using our contact us page to receive a quick response to your inquiries. Located in beautiful Orange County, California. Copyright © 2004-2019 Tobacco Barn. All Rights Reserved. This website is not intended to be viewed by anyone under the legal minimum purchase age in your state. If you are not of legal age please do not enter this site.